I got a message a couple of days from someone who’s worked with Olusegun Aganga in the past. He said he had read my blog posts on the auto policy and wanted to put me in touch with the Minister so I could hear his own side of the story. Long story short – the Minister rang and we spoke for exactly 1 hour 3 minutes. If he’s ready my previous blog posts abusing him, he certainly didn’t show it. He was polite and answered all the questions I asked him. I expected a much more arrogant person but the person I spoke to sounded somewhat chastened or tired even. I took notes so here goes. I asked why the policy document itself had not been released and he said the ‘implementation document’ will be released by the end of January. This confused me a bit – It appears that he submitted his plans to the FEC without knowing when they would be approved. In any case, they are working on a document to bring together the ‘7 points’ of the policy and how they will be implemented. So we will keep an eye out for that. This was probably the most interesting part of the conversation. He said that any manufacturer or dealer or whatever that is on ‘the programme’ will pay tariffs at 35% not 70%. I asked him to explain ‘the programme’ and he wasn’t quite clear on this, but I took this to mean they have signed up to the policy in one way or the other. According to him, the 70% tariff is a disincentive to encourage people to do some kind of assembly in Nigeria. According to him, those on ‘the programme’ who take advantage of all the incentives can actually end up paying 20%, less than they currently pay. He said for every SKD (Semi Knocked Down) car assembled in Nigeria, the manufacturer will be allowed to bring in 2 FBUs (Fully Built Units) at 35%. Long story short, this policy will not increase prices according to him. In fact it might reduce prices. This is all fun and games of course as there is plenty of money to be made from ignorance and misinformation in Nigeria. I told him I had heard some dealers already putting up prices and he said the National Automotive Council (part of his ministry) have a team that is monitoring prices weekly. It’s unclear what powers they have if they find dealers taking Nigerians for a ride but he said someone already tried it and Stallion Motors quickly released more cars into the market at the normal prices. According to him, Stallion were able to sell 1,500 cars by undercutting their competitors greed who then had to drop their prices. The obvious problem here is therefore Tokunbo cars (and luxury cars which wont be assembled or manufactured in Nigeria). There is nothing for them in the policy so the full 70% tariff will hit such cars. Given that this is where the market currently is in Nigeria, people are going to feel the pain indeed. It might end up closing the gap between new and used cars to the point where people feel it’s better to simply go for new cars but then this doesn’t make cars any more affordable. I am not allowed to disclose a particular change to the policy that will be announced next week but look out for it. A Vanguard journalist mentioned to me a couple of weeks ago that the Minister had mentioned to them that there will be a ‘finance package’ in the policy. So I asked about this. He said that NAC, the OEMs and banks have been working together on some car loan schemes. He said that Rand Merchant Bank currently finances 1 in 3 cars bought in South Africa and they have said signed up to the policy and will be announcing some car loan schemes soon. We got talking about Innoson and he mentioned that he currently uses an Innoson Jeep – the IVM G5 which he said costs N4m-N5m. According to him ‘when you enter it, you will know you are in a Nigerian car but it is our own’. He listed various problems with the car and also mentioned that the car was given to him by Governor Peter Obi who bought a few of the Jeeps when it was released in September 2013 to distribute to royal fathers in Anambra. This was in response to my question on using export discipline to get the cars to be improved quickly. He said all their complaints have been sent to Innoson who will be releasing the next model of the Jeep in the first half of this year and he hopes those problems will be fixed. He said Innoson is currently at 40% local content in its vehicles and employs 7,000 people of which 4,500 of those work in its plastics business. He said that since cars are mainly made with plastic these days he reckons Nigeria can get round the fact we don’t currently have a steel industry (although he later mentioned part of the policy is to make iron ore more accessible to those who want to turn it into steel). I asked what the vision of this policy is i.e. what do we want to become? I spoke about how Mexico manufactures over 3 million cars annually (even though there is no ‘Mexican car’) but exports more than 80% of them creating 500k jobs. I then mentioned how South Korea grew its car industry and we now have Hyundai and Kia. So do we want a Made in Nigeria car and be South Korea or do we want to be a manufacturing hub to create jobs and be Mexico. He said we can be both. He kept going back to the South African industry for his examples which reflects the fact that most of this policy has been based on the South African market and input from the former South African minister for transport. He said his target market is the ECOWAS region of 300million people of which half is of course Nigeria hence why he thinks we can do both. ‘Look at Dangote. When we first started it was simply to address the local market, now we are at 28 million metric tonnes per annum which is more than local demand so we can export. I believe we can replicate this with sugar and cars’ he said. To tackle smuggling, he said that FRSC and Customs are currently working together on a computerised system of some sorts. According to him, before a car is registered, FRSC will be able to check immediately with Customs if the correct amount of duty was paid on the car. If the correct duty wasn’t paid, then FRSC wont register it. Presumably this will mean that any car smuggled in through Benin Republic and other such places wont be registered. I asked when this system will be up and running and he said ‘soon’. ‘You know when we go to the FEC, you never know if your proposal is going to be approved that day or not. So when my policy got approved on October 2nd, I called the Nissan Chairman that same night to tell him. 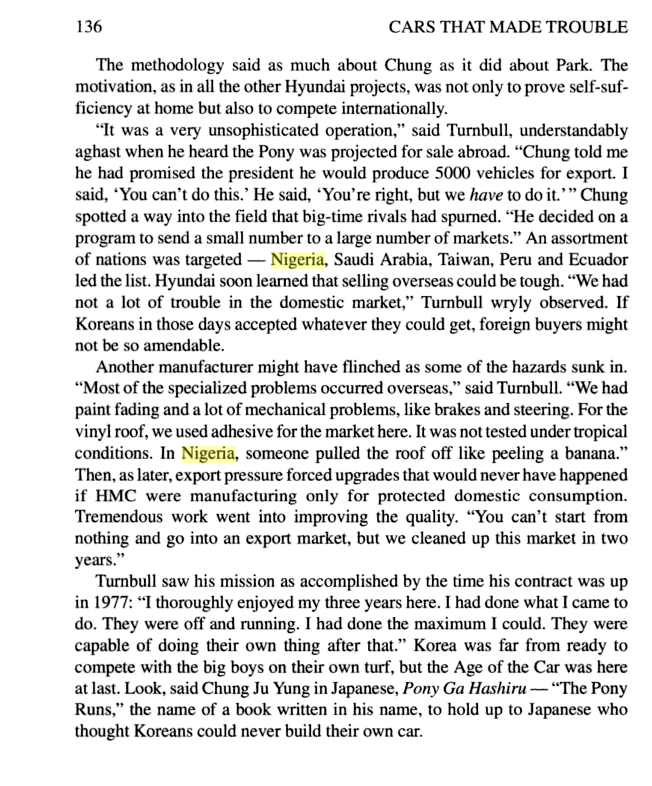 One week later on the 9th, they made their announcement that they were going to start car assembly in Nigeria’. So I asked how all of these plans were going to be funded given that there is a big role for the government to play and his whole ministry only gets N15bn (N13bn recurrent) in the annual budget. He said ‘we have no money but the good thing is that our work in my ministry requires more brain than money because our job is to design policies’. He mentioned how the US and Japanese embassies have committed to funding the construction of some of the auto parks they are looking to build across the country. He said NAC is funded by some levies so to an extent they are independent. His ministry has 17 agencies under it and everyone just fights for their survival basically. He mentioned that being a former Finance Minister gave him an understanding of how tight money is across the board so it is what it is basically. I asked to try my luck with one last question and told him I have heard President Jonathan is going to name him as the new CBN Governor. He gave the boilerplate answer of how he is focused on his job and doesn’t concern himself with such things. I tried again by asking what will happen to all his policies if he gets moved to the CBN especially as he hasn’t legislated any of them. Same response. Finally I told him that surely if President Jonathan asks him to go to the CBN he couldn’t possibly say no. Same response. He kept mentioning the NIRP and I told him I have actually been looking for the document but I couldn’t find it anywhere. He said the document wasnt ready yet but he had started implementing it. According to him President Jonathan will be launching the document later this month. He said he has been working on it for a year and also implementing it in that time. He talked about how Stallion couldn’t have imported 3 years worth of cars given that they have signed a deal to start assembling cars in Nigeria soon. He spoke about how everyone was carried along from the beginning of the policy design in 2011 and how it is expected that people will make noise now that their business model is about to change. Spoke about how the vested interests against the policy are well-funded and connected but he expects all the noise to die down soon. On two different occasions he said ‘I don’t want consumers to suffer’ and ‘consumers must not suffer’. He also said he wants to be able to sleep at night after making policy. He also spoke about the different aspects of the policy from boosting skills to manufacturing parts and international standard accreditation for anything we make. The policy is also about tyres and he restated the well-worn line about how Nigeria’s rubber is the highest quality in the world so we should be making tyres and international tyre manufacturers have indicated their interest in coming to set up in Nigeria. These are not my views. I have tried as much as possible to restate the Minister’s position as best as I heard and wrote them down. I think I have written about 4 times on this auto policy already and that is more than enough. I am hoping you read between the lines of the above and come to your own conclusions. It’s no news of course that Nigeria is a messy and difficult place to do business,nevertheless fortune will always favour the brave with spectacular rewards. So I am going to be doing some posts on ways to ‘hack’ some specific problems in Nigeria, with a technology bias int he solutions. We already have Bus and Oya catering to the long distance bus travel market. Railway doesn’t look like fun now but I imagine it can’t get much worse (well, this is Nigeria) so given how bad things are and the pent-up demand for safe long distance travel, if the services improve even marginally, demand will also increase by several factors. a) If you are well-funded, simply buy up the tickets wherever you can find them – even if it’s from touts and keep them as ‘inventory’ on your platform/app/website/whatever. You probably won’t make any money initially (or you might) but once you start building up repeat customers and being known as a reliable outlet for tickets, things can get really interesting. b) Simply walk up to NRC and make them a better offer than whatever it is the touts are offering them to shift the tickets. You can offer payment upfront as well as I am sure the touts are not so inefficient to the point of keeping much working capital. The final piece of the jigsaw puzzle will be to figure out the most efficient way to get the tickets to customers painlessly as possible. For example, people might buy the tickets in advance from your website and then you have a guy in uniform in an office near the station where they can go and present a text message or whatever and pick up their tickets avoiding the chaos at the station itself. This is something I have been thinking about for a minute. A 50kg bag of cement in Nigeria costs between N1,650 and N1,800 I understand. Now I cant find the link again anywhere but I am sure I read Aliko Dangote say during the whole ‘cement glut’ episode that factory prices (I think at Obajana) were around N800 per 50kg bag. Minimum order size – you obviously cant walk up to the factory gate and buy one bag for N800. You probably need to order a whole trailer which might cost say N20m. This is already a barrier to entry. There are probably more but somewhere in those 3 costs is a decent chunk of the gap between factory gate prices and what consumers end up paying, plus the distributors profits of course. a) What if you had a way of aggregating demand from small buyers? So if you could collect the demand from all the small guys who only want 10 or 20 bags at a time. If you find a way of getting enough of these guys, you can have enough demand to fill a trailer and buy from the factory direct. b) Keep your costs as low as possible – just offer a service. Once you have enough demand, you hire a truck and pick up from the factory. Buyers will need to collect their orders within 24hrs as you will need to avoid those storage costs like a plague. You can even have a location where people come and collect their cement immediately its ready. c) Charge a small fee per bag or percentage per order. Nothing new here of course, it’s simply designing a way of cutting out the middle man and costs in the supply of a product. The challenge will be developing a system to aggregate those orders. There will be a lot of legwork involved in going around and convincing then signing up the little guys who regularly buy cement from distributors. Hey, you can even hide from view near a major distributor and watch as people come and go with their cement. This might be a way to get customers. But don’t let them catch you sha. One final thing – payment. Do you collect money in advance or on delivery? This is a headache and I am not sure the best way to approach it. People wont be keen on paying in advance especially if you are a new business. If you operate a payment on delivery, you need to finance the purchase yourself with the risk that someone who ordered wont turn up to pay for their cement. So a solution might be to collect say 15% of the order upfront and finance the rest. Non refundable of course. I know I know. Yoruba people say you shouldnt go back to say ‘Good evening’ in a place where you have already said ‘Good night’. I did in fact promise not to write on cars again but if I break a promise so early in the new year, I have the rest of the year to make it up I reckon. Let me try one more time. This time I will turn 180 degrees from abuse to praise singing. Here goes…. Chief Dr. (Dr.) Olusegun Aganga, Honourable Minister for Trade and Investment, The Golden Man of Goldman Sachs. You are in an Aston Martin while your enemies are chasing you in a 30 hour Lagos to Kano train. I pledge unalloyed fealty and stainless loyalty to your ever-expanding kingdom. After you Sir, it is you again. Sir, your enemies are at liberty to jump into the undredged River Niger if they cannot abide your relentless drive to develop the Nigerian economy. Happy New Year Sir. 1. Sir, I’ve looked through your ministry’s budget and I cannot see any line item for the purchase of document shredders in there. Is it too late to add this? I ask because the first step of the Alternative Auto Policy (AAP) I am proposing is for you to gather all the copies of the current policy you are proposing and shred them. Please stay with me Sir, I am going somewhere. 2. Have you seen the video below? I imagine you have but on the off-chance that you havent, let me post it here again. Rather than start from the bottom like the rapper Drake, my AAP proposes to start around the middle. The first step of this policy I am proposing is to adopt Innoson Vehicle Manufacturing as Nigeria’s de facto auto policy. Sir, they are already making cars in Umudim, Nnewi in Anambra State. So rather than wait for Nissan and the likes to come open plants here (in itself not a bad thing) let’s support Innoson in some smart ways. 3. The first step of my AAP is to completely ignore the Nigerian market. Yes, trust me this makes sense. Government support for IVM should be tied entirely to exports. So please, dear God, don’t get Mr. President to issue a directive to all government ministries and departments to only purchase Innoson vehicles. It will be very counter productive. Ignore Nigerians, trust me they are not worth the stress. I will explain this further below. Mandating government to only buy Innoson cars will ruin a fundamental part of industrial learning viz carmaking – the feedback mechanism. Also, knowing what civil servants can be like, they will quickly turn such a directive into a racket. 4. Hire a top-notch PR firm, preferably a European or American one to clean up the company’s image. They will take care of little things like Innoson listing Gmail and Yahoo! addresses on the contact page on its website. These are small things but they do matter – it might be the difference between them getting a feature in a popular newspaper magazine if the hack in charge is not impressed by such an email address. As a wise Nigerian man once said – packaging is everything. You will also need to spend heavily on advertising. Hire a firm that knows how to advertise across the continent. 5. So where do we export Innoson cars to? I suggest we use a crude measure to pick say 10 countries. According to the World Bank, Nigeria’s GDP per capita is currently around the $1,500 mark. Leave aside the accuracy or not of this figure for a moment – pick 10 countries in say Asia and especially Africa that are around that mark or less. So obvious countries would be Kenya, Ghana, Sudan (soon as they stop fighting), Uganda etc. You get the gist. We are looking for countries with an infrastructure deficit like ours. I reckon the IVM G5 stands a good chance in countries with bad roads like ours but which your Glorious Transformative Government is urgently addressing. 6. This is where you will start spending serious money. You are going to subsidise Innoson vehicles for sale in these markets. The price will have to be low enough to account for the lack of brand awareness and competition from established brands. Forget about making any profits at all, that’s not the point for at least the first 3 – 5 years. If people are going to enter a car named after an Igbo name from Eastern Nigeria, we will have to meet them halfway. Simply put, the price of Innoson cars exported to these countries will have to be significantly cheaper than anything on the local market. So prices will have to be tailored for each market. Government support can be tied to a specific amount for each car – say for each IVM G5 sold in Uganda, the AAP can commit to paying $2,000 to ensure Ugandans take notice of the price difference. 7. Dont close your cheque book yet Sir. Another market share gaining strategy will be for Innoson vehicles to be sold with market beating warranties in those countries. I recommend 3 years parts warranty on all Innoson vehicles. Or more even. This is going to cost a lot of money because Innoson are basically untested fully by the market. The AAP hopes for the best but prepares for the worst. Once the rubber hits the road expect all kinds of feedback. Let us be humble – last year the great Toyota recalled almost 1 million cars to fix issues with the airbags. This life is a pot of beans and no one really knows what might happen when once the cars are out there in the hands of customers. Trust me, you don’t want Africans on the internet posting photos of broken down Innoson vehicles on Twitter, Facebook and Instagram. This means Innoson will have to maintain a high level of spare part stock to ensure it can answer replacement needs quickly. This is why it is important to avoid going down the route of mandating government purchase of these cars. Civil servants have an incentive to change government cars as often as possible anyway so they wont really care if the cars have issues. Innoson wont get the brutal feedback it needs to improve from government sources. It is also why Nigerians should be ignored in the AAP. I know what they are like – the easiest way to get them to buy the cars is to have it validated by ‘foreigners’. Also, ignoring Nigerians helps us resist the temptation of tariffs that our governments like so much. When Nigerians don’t buy the cars, the next thing will always be to target imported cars as the enemy, achieving nothing. In fact, I suggest that the price of Innoson vehicles in the Nigerians are raised as high as possible to make up for the foreign subsidy but the AAP will make cheap financing available for Nigerians who choose to buy them. But please don’t force them to buy it. 8. As part of this AAP, Mr Innocent Chukwuma will be promoted to Chairman (with his ownership structure of the company untouched). A CEO with solid experience of selling cars in emerging markets should be hired on a time bound contract of no more than 5 years. Aim for the very best you can find. We cant get someone like Carlos Tavares but you get the idea – talented, proven track record at the highest level and multi-lingual (he speaks 4 languages). Even if you cant find someone with auto manufacturing experience, someone with solid knowledge of international supply chains will do the trick. Mr Chukwuma can return as CEO after 5 years by which time the process of weaning Innoson off the AAP should have begun. 9. As part of this AAP, kindly return all auto tariffs to where they were before. Thank you. No need to add more corruption and smuggling to the problems we already have. 10. Pray. Yes, you will need to pray. Against faceless witches and unnamed wizards. Against saboteurs and permanently bitter people. Nothing is guaranteed of course but you can make your own luck. So why all this aggro in the name of a policy? Let’s be honest with ourselves, Innoson wont even employ 20,000 people anytime soon and the AAP is aiming for the export market. There are a couple of reasons for this. The first is to avoid the [Name withheld] situation where Nigerians feel exploited in the name of making one man very rich. If the government is going to pick winners, you can at least avoid the downsides of doing so as best as you can. If you are exporting the cars based on this AAP, the no one can really say they were ‘exploited’ to buy the cars which we are effectively bribing them to buy. I cant say this enough – leave Nigerians out of this. The second reason answers the jobs question. Why are we doing this? The answer is something that is not easily quantifiable – pride. Be honest, you and me and millions of other Nigerians, want a car manufactured in Nigeria for reasons of pride. You cannot add pride to GDP but it will be there when Nigerians can boast about such cars in foreign countries. It will be there when news stories around the world are written about ‘the upstart car maker that began life in a sleepy town in eastern Nigeria’. But most of all it will be there when Nigerians, unprompted, start buying Innoson vehicles based on a CNN report on ‘the Nigerian car maker that has come from nowhere to grab a huge share of the SUV market in Uganda‘. Is this all too hard? Ehn, no be you talk say you wan industrialize Nigeria? Remain blessed Sir. It is well with you and yours. You will eat the good of the land.